Check out the wonderful articles and recipes and more at our Yahoo Groups ! Join Today ! 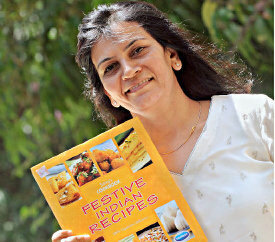 Saroj Kering from Pune, India - The immensely popular chef from Bawarchi.com fame has her new cookbook out, called "Festive Indian Recipes" Read all about her online culinary journey! Are you wondering what people around the world are saying about "Indian Food"...Here is the Great, Good, OK, Bad and the Ugly....brought to you exclusively by Tweetizen ENJOY!!!! Want to advertise? Low monthly rates. Free month for yearly pre-pay. Act now. Birthday, Thank you or Christmas gifts! We deliver all over the USA! Welcome to CuisineCuisine.com where "Food is Culture & Culture is Food" ! A fun site for anyone interested in learning how to get started with Indian Cuisine and would like to learn more about the Indian Culture. You will find fun things to explore and do so take your time and browse through the many Channels. This will be the perfect addition to your Indian pantry!!! 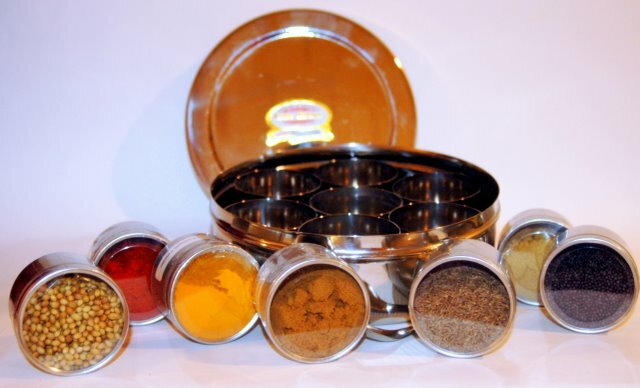 This top-quality stainless steel Traditional Masala Dabba or Indian Spice Box has a special inner lid and nestled inside the box are seven stainless steel spice containers. 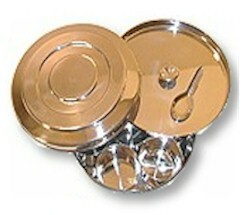 It comes with a stainless steel spoon too for easy dispensing. Fill them with your spices or your favorite spice blends. Note: These don't last. Please order soon! MAKES A GREAT CHRISTMAS GIFT !!! Each tin can comes filled to the brim with spices and is labeled for you. Stack them up in your spice cabinet. Easy to see and easy to use. Each custom blend Masala has a distinctly unique flavor, and is made from only the finest ingredients. All come labeled !!! They are packed in a glossy black box and tied with a bright red grosgrain ribbon. Makes a great gift. What do you know about the basic Indian Spices? Did you know that Turmeric has antiseptic qualities or that cumin helps in digestion? Spices have been mentioned in the age old Hindu scriptures called the Vedas and have also been seen mentioned in the ancient Egyptian papyruses and the Old Testament. It was the Romans that actually discovered their culinary possibilities. Besides their intrinsic qualities of healing and preservation, spices have always been believed to have magical qualities. Learn all about the Basic Indian Spices here!! Did you know that spices like red chilies, green chilies and limes were used to cast spells? The word spice comes from the Old French word espice and the Latin root which means "a commodity of value and distinction". Historians tell us that spices were often more valuable than gold or precious stones, and the trade of spices has been an extraordinarily influential factor in shaping the history of the world. Did you know that hot spices release endorphins, the body’s natural painkillers, giving rise to pleasurable and even euphoric sensations. Ahh!!! Now that is one reason to add spices and easy Indian recipes to your repertoire of daily meals! Store spices in a cool, dark place. Humidity, light and heat will cause herbs and spices to lose their flavor more quickly. Although the most convenient place for your spice rack may be above your stove, moving your spices to a different location may keep them fresh longer. As a general rule, herbs and ground spices will retain their best flavors for a year. Whole spices may last for 3 to 5 years. Proper storage should result in longer freshness times. Click here for more..
Erica Fredrikson from San Francisco, CA, USA says Great website! Since I returned from a semester in India, I have been practicing my Indian cooking, but am often frustrated with ingredient names or techniques which are unfamiliar to me. Thanks for such a clear, informative website! Ultimate Gift Shop ! Find unique gifts for a special occasion ! Cook Book Store! Best bargains in cook books ! Copyright © CuisineCuisine.com, LLC All rights reserved.